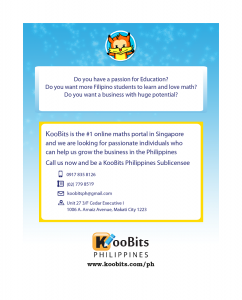 KooBits Maths Challenge, Singapore’s most popular national online Maths contest, participated in by grade school Singaporean students, is now in the Philippines. Koobits Challenge’s game dynamics make it highly engaging and motivating to students. It uses the latest technology to design personalized, daily learning activities to help students develop effective study habits, acquire problem-solving and life skills to build a broad and deep foundation for learning. It will be the first nationwide, online Singapore Maths competition in the Philippines for students in grades 1 to 6. Read on below, or check these slides for more information. How is KooBits Maths Challenge different from traditional Math contests? It’s about how good and intelligent a student is. It’s about how good we want the student to be. Are worried about children’s excessive computer time which is often spent in playing games and watching online videos. What is included in the in the KooBits Maths Challenge Program? Participants login to www.koobits.com/ph and are assigned a personalized sets of daily task based on their grade level. They earn points by completing these learning tasks independently. They can also challenge each other to improve fluency in core competencies. How do I sign up my child / student? Payment may be made through Mathemagis centers (www.koobits.com/ph) or through direct bank deposit. Login at www.koobits.com/ph and start learning and earning points! Explorarium Co. Ltd is the Philippine Master Country Licensee for Koobits Pte. Ltd. Singapore. For questions and other details, you may visit KooBits Philippines’ office at Unit 27 Cedar Executive Bldg 1006 Arnaiz Avenue, Makati. You may call us at 779.8519 / 0917.835.8126 or email us at koobitsph@gmail.com. How can I help bring KooBits to more schools and students?